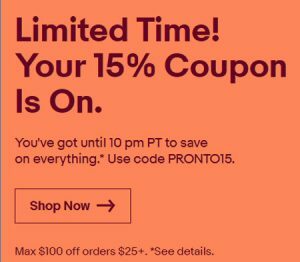 eBay will kick off another sitewide flash sale at 8 am Pacific (11 am Eastern) that gives shoppers a 15% discount. The sale ends at 10 pm Pacific today (August 8, 2018). 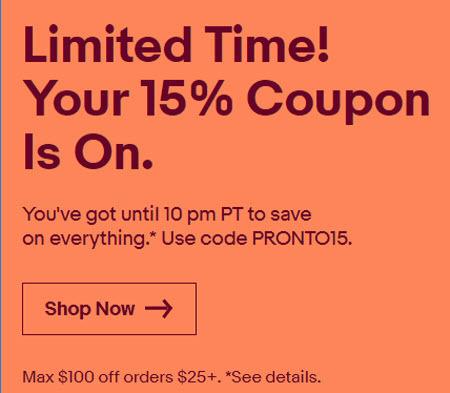 Shoppers must use the coupon code PRONTO15 at checkout to get the savings. The sale is good on eBay.com and eBay Canada, and it excludes the Coins & Paper Money, Gift Cards & Coupons, and Real Estate categories. Shoppers must make a minimum purchase of $25, and the coupon is capped at a maximum value of $100. The coupon must be used within a single transaction (and can include multiple eligible items) “while supplies last,” and users can only use the coupon once. eBay does not publicize the sales until they go live, but some readers have been able to send us information in advance. That’s the case with today’s sale – here’s a link to the terms. One reader is concerned about the implications of some sellers getting the information early and how they may react. “I believe there are a great deal of price increases immediately preceding, and shortly into, sitewide flash sales with larger (specifically tech) sellers,” he said. In other words, he’s concerned that a seller of an item regularly listed at $699 might temporarily hike the price to $799 during the sale so that when shoppers apply eBay’s $100 coupon to the item, he gets the $100 premium while offering buyers only a perceived discount. He also believes that buyers have begun deferring routine purchases to splurge on eBay’s periodic flash sales, leading to eBay’s subsidies helping bigger tech sellers at the expense of smaller merchants. Most of eBay’s flash sales provide a percentage discount, while some provide a set dollar savings – for example, on Amazon Prime Day (July 17, 2018), eBay ran a sale giving shoppers $25 off a minimum purchase of $119 – which is the cost of an annual Amazon Prime membership. The site just kept “losing” the sale code every time I went to checkout. After about the fourth or fifth time, I just went somewhere else to spend my money. Sadly, it was just as disappointing on the seller side as it delivered no sales (my last sale was July 28th and before that was July 6th). I bought my 1st item from the fleacebay site in many years. It was something I was going to buy local, but, since fleacebay was paying for the discount, I saved $100. Now, if my item arrives and is what I bought, thanks fleacebay.